In the hoarding, Bengal chief minister Mamata Banerjee’s picture was seen along with Rabindranath Tagore, Kazi Najrul Islam, Iswarchandra Vidya Sagar, Swami Vivekananda and many more legends. Kolkata: Bengal is known for its cultural legacy to the rest of the world. However, a snapshot of a hoarding that went viral on Thursday has shocked the Kolkatans. 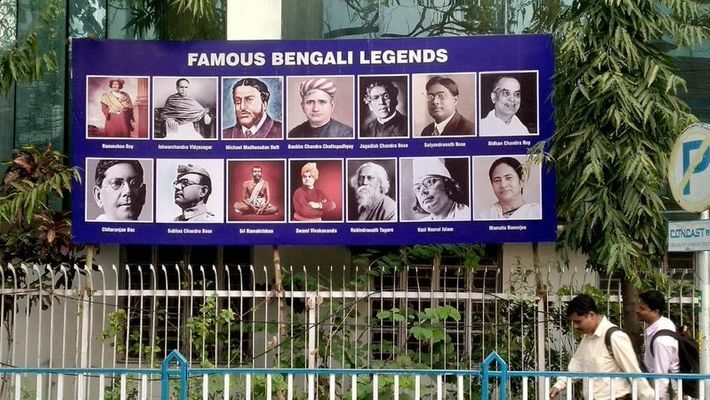 In the hoarding, Bengal chief minister Mamata Banerjee’s picture was seen along with Rabindranath Tagore, Kazi Najrul Islam, Iswarchandra Vidya Sagar, Swami Vivekananda and other legends. The billboard is located in sector V, which is known as the tech hub of Kolkata. However, such a celebration of Banerjee is nothing new to the residents of Kolkata. Earlier, the chief minister’s photograph was placed along with Satyajit Ray, Ritwik Ghatak, Mrinal Sen many more renowned film directors during the Film Festival 2019 at the Nandan cultural centre. All the above-mentioned people were not only stalwarts in their respective fields but also won the hearts of people across the world with their talents. For instance, Rabindranath Tagore was the first non-European to win the Nobel Prize in Literature. On the other hand, Kazi Nazrul Islam emerged as the rebel poet during the British Raj. What is shocking here is that the TMC believes Mamata Banerjee is one of them. Well, the Kolkatans seem to disagree with this. People have been posting the screenshot of the billboard on several troll pages on social media.